Gerald A. 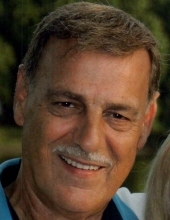 "Jerry" Denton, 75, of Momence, IL, He died on Sunday, March 24, 2019, at the Presence St. Mary’s Hospital in Kankakee, IL. He was born on February 18, 1944, in Kankakee, IL, the son of Arthur and Alice E. Tisbury Denton. He married Dianne L. Fry on August 7, 1991, in Ouray, CO. She survives. He is survived by one son; Brandon Denton of Momence, IL, and three daughters and two sons-in-law; Laura (Eric) De Biasi, of California, Mitzi (Erich) Frutiger of TN and Amber Denton of Momence, IL, and one grandson Devin Frutiger. One brother; Bill Denton of Momence, IL also survives. He was preceded in death by his parents, one brother; Paul Denton and one sister, Rita Smith. He was employed as a security guard for the state of Illinois for Manteno State Hospital and Shapiro Developmental Center in Kankakee, IL. He served in the United States Air Force stationed in Alaska, during the Vietnam Era. He was member of the Calvary Community Church, American Legion of Aroma Park, IL, and former alderman for the City of Momence. He enjoyed listening to Elvis Presley, singing karaoke, watching Westerns and game shows, and spending time with his family. To send flowers or a remembrance gift to the family of Gerald "Jerry" A. Denton, please visit our Tribute Store. Rev. Randy Schweizer will officiate. "Email Address" would like to share the life celebration of Gerald "Jerry" A. Denton. Click on the "link" to go to share a favorite memory or leave a condolence message for the family.